I am a huge fan of the Bright Starts line. The items are extremely colorful and designed to stimulate my son’s development. I was super excited to receive my Start Your Senses™ Sensory Plush Pal. My son is just reaching the age where he is easily grabbing and holding his toys and it is so much fun to see him interact with new ones. The Sensory Plush Pal we received is an adorable butterfly. Each of the wings is made of a different colored fabric. Two of the wings have bold geometric patterns and the other two are solid colors. Some feature a felt-like fabric that crinkles and others feature a satiny fabric that is smooth. The plush body is large and easy to grab onto. My son loves hugging it and chewing on the top of the butterfly’s head. Hanging off the body are two rings, a rubbery leaf that is great for teething, a mirror and a bee rattle. 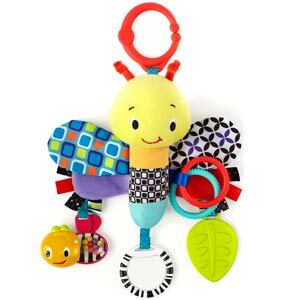 The colors and patterns are excellent for developing baby’s sight and the rattles and rings stimulate baby’s hearing. The different textures help develop baby’s sense of touch. My son loves this toy so much that he barely fusses anymore when we put him in his car seat. When I pick him up from daycare, I hand him the Sensory Plush Pal and he smiles at it in recognition. He “talks” to the toy and crinkles it as we are driving around together. I can actually concentrate better and worry about him less because of how taken he is with this toy. It is big enough to hold his interest but extremely portable for on-the-go play! For more information about this and other great products from Bright Starts, visit their website today! Connect with Bright Starts on Facebook.